This beautiful wedding at Great Fosters used my favourite colour combination of blush and silver, and looked so gorgeous! 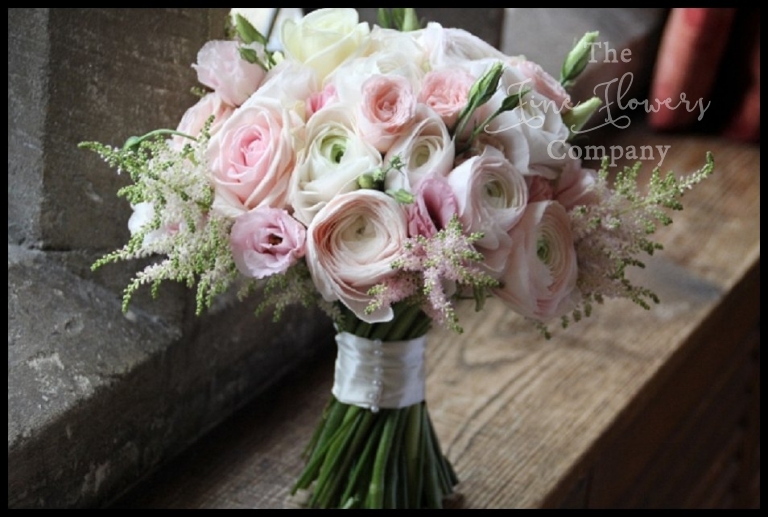 Starting with a pretty blush bridal bouquet of blush roses, large ranunculus, lisianthus and astilbe, the blush theme continued with bridesmaids bouquets of blush hydrangeas, roses, lisianthus and ranunculus. The flower girl carried a pretty pomander of pretty gypsophila and spray roses. 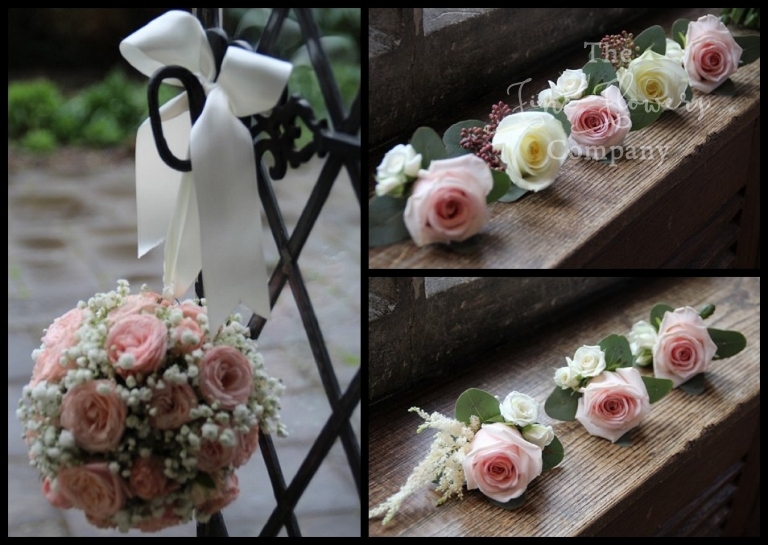 The men’s buttonholes were ivory and blush roses with astilbe, spray roses or berries. 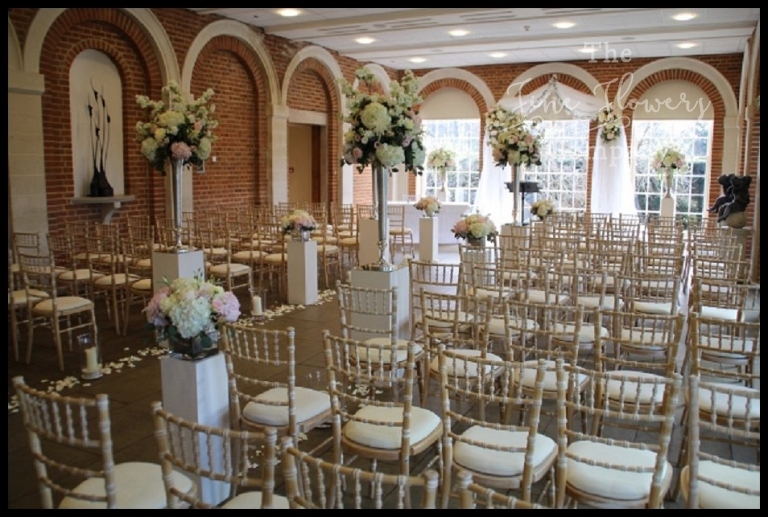 For the wedding ceremony in the Orangery at Great Fosters, the room was styled with tall silver fluted vase displays down the wedding aisle, alternating with low silver cube vases, all on ivory plinths. At the ceremony end, we created a beautiful backdrop with an ethereal tulle drape framing the central window, and flanked that by lovely focal urn centrepieces. Finally, the ceremony table was dressed with silver vases with flower posies, and pillar candles. The wedding breakfast was held in the Tithe Barn, which was dressed with a mix of the tall and low silver vases used prior, in the the ceremony room. The tall fluted vases, with additional low cluster of vases and candles around their bases, were used to dress the middle of the tithe barn, to add much needed impact high up, reflecting the tall ceiling. The low cube vase displays were used on the tables to the sides of the barn. And finally, we laid out silver vases for the bridesmaids bouquets to be placed in them on the top table, and added vintage silver candlelight holders – a mix of tall stemmed votives and pillar candles, votives and candle vases. The whole look was pretty and light, and was a nice mix of formal glassware / vases but relaxed flower displays. Our candlelight selection and Party Light’s fairy lights completed the look!